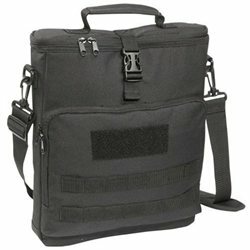 SOC Gear Laptop Computer Bag ..
15" laptop case, a step up from a basic laptop sleeve with a carry handle and removable shoulder strap. Front pocket with hook & loop closure, with organizer panel. Name tape panel, external slip pocket with reinforced stitching and rust-resistant hardware and zippers. Great accessory when used with a #5016 Bugout Bag. Measures 15" Long 12" wide 2.5" deep Sandpiper of California 15" Laptop Case, A step up from a basic laptop sleeve with a carry handle & removable shoulder strap. Front pocket with hook & loop closure, with organizer panel. Sandpiper of California Laptop Case (Black, 15x12x2.5-Inch) (Spo.. I purchased this laptop case because it was streamlined and professional looking. And it was designed to hold a laptop.Product Description:Overall the product looks to be high quality, the stitching looks good and some of the stress points are even double stitched. Always a good sign. Zippers look strong as well.The main compartment is more than thick enough for a laptop, in fact I store my Samsung QX410 laptop in there along with a leather professional folder. ..